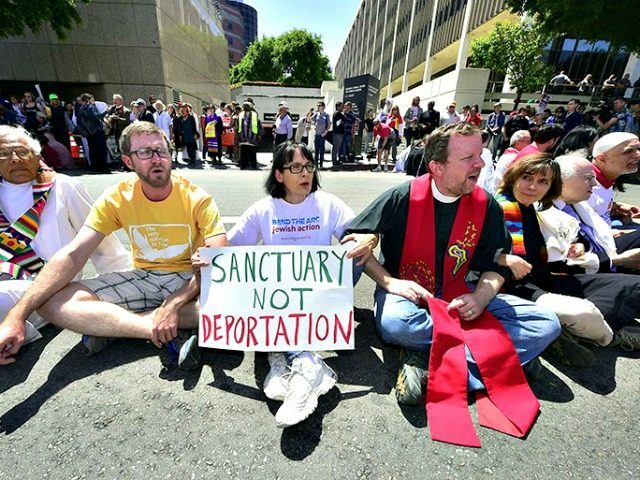 The draft 2018 omnibus bill denies President Donald Trump explicit authority to withhold federal grants from the Democratic-dominated “sanctuary cities” which are trying to secede from the nation’s immigration laws, say Hill sources. There is “nothing in the omnibus bill to stop funding for the sanctuary cities,” said a source. “It will just be a continuation of the status quo” because Democrats threatened to torpedo the funding bill if it included new rules allowing administration officials to block federal funding to the cities which shield illegals from deportation, the source said. Federal funding cuts would be “a huge financial hit for Democratic strongholds … [and] I just think that [GOP leaders] don’t want to have the fight,” said Rosemary Jenks, policy director at NumbersUSA. The lack of Capitol Hill action against sanctuary cities is good news for cheap-labor employers in New York and California. For example, many employers in the restaurant industry rely on illegal immigration to fill low-profile jobs in restaurants — dishwashers, cooks, and busboys, for example. Those illegals also help lower wages paid to Americans and legal immigrants. But the failure to fight Democrats on sanctuary cities is also bad news for GOP candidates in November, said Jenks. Sanctuary cities are very unpopular with voters, and few GOP legislators are politically threatened by curbs on sanctuary cities, yet the GOP leadership refuses to make them a November election issue, she said. Instead, GOP leaders are working with Democrats to raise spending — and are ignoring the conservative GOP members who want to limit spending and also fight on immigration issues. “I can’t fault conservatives in the House for saying ‘I’m not going to a do $1.3 trillion spending bill’ …. [so it is] going to be a bipartisan giveaway,” Jenks said. “All of the [GOP] conservatives who want to fight on immigration, and who know the issue, none of them are voting for the omnibus anyway, so they have zero leverage” in the closed-door negotiations, said Jenks. “We’re trying to make sure nothing too horrible get puts in it,” she added. The 2017 omnibus bill appropriated $1.1 trillion, but the 2018 omnibus is a $1.3 trillion treasure chest — and GOP leaders are getting the votes by letting Democrats exclude immigration-related issues. “There are a lot of Republicans who feel the same way as the Democrats do on immigration, and they don’t see it is worth having a fight over Trump’s [immigration] priorities when they basically agree with the Democrats,” said Jenks. “Senate Democrats seem to be calling most of the shots,” House Freedom Caucus chairman Mark Meadows (R-NC) told Breitbart News Daily March 20. So far, Democrats have apparently blocked action to reform the scandal-plagued EB-5 visa program, to grant funding for the border wall and to fund Trump’s request for more beds to detain migrants. Democrats and Republicans are likely to agree on about $1.6 billion in border funding that would help finance some fencing and security and avoid directly funding the large concrete wall that Trump wants, according to a Democratic aide. A few stubborn disagreements persisted into Tuesday evening. One of them revolved around the Republicans’ push for funding for the border wall and heightened enforcement of immigration laws — priorities of President Trump’s but a non-starter with the Democrats. Democratic open-borders groups also are lobbying Democratic leaders — including House Minority Leader Nancy Pelosi — to minimize funding for immigration enforcement, including funding for detaining migrants. Without enough empty detention-beds, border agents must fallback to “catch-and-release” policies which allow many migrants to freely travel into Democratic-run cities. “I assume Democrats will win, and there will not be much — if any — additional funding for beds,” said Jenks. “By not allowing the funding of beds, it’s in essence just endorsing the policy of [an] unfiltered flood of illegal immigration across the border. So that’s one that’s hard for us to comprehend,” Short said. Trump also pushed Ryan and Senate Majority Leader Mitch McConnell (R-Ky.) in recent days to close a narrow deal that would protect immigrants enrolled in the Deferred Action for Childhood Arrivals program for three years in exchange for $25 billion in border wall funding, according to two Republican officials familiar with the discussions. The officials spoke on the condition of anonymity to disclose confidential negotiations. Democrats were pushing for protections for a larger pool of immigrants, but a Democratic aide said the White House was rejecting that approach. The aide said Tuesday that there are continued musings about a deal but that chances for an agreement were remote. The aide spoke on the condition of anonymity to discuss private negotiations. In February, Democrats allied with business-first Republicans to block Trump’s popular immigration reforms, which would have ended the visa-lottery program, begun phasing out family migration, enacted legal reforms to close of border-loopholes and also funded border wall construction for several years. One “horrible” proposal likely excluded from the omnibus bill is a measure that would have allowed contractors to import a huge number of H-2B foreign workers to help with repair jobs in hurricane-damaged areas of Houston, Texas, and in Florida, said Jenks. If the 2018 appropriations fight is won by Democrats, it will be a replay of the December 2015 fight, in which Ryan and the money-minded GOP leaders on the appropriations committees “gave away the store,” according to Pelosi. “Almost anything, the Republican leadership in the Senate achieved this year, they achieved on Democratic terms … Democrats had an amazingly good year,” Schumer said in December 2015. Many polls show that Trump’s 2016 immigration policies are very popular in the polling booth. His proposed amnesty for 1.8 million illegals gets high scores in business-funded polls but is unlikely to shift any votes into the GOP column in November. Immigration polls which ask people to pick a priority, or to decide which options are fair, show that voters in the polling booth put a high priority on helping their families and fellow nationals get decent jobs in a high-tech, high-immigration, low-wage economy. Those results are very different from the “Nation of Immigrants” polls which are funded by CEOs and progressives, and which pressure Americans to say they welcome migrants. Republicans are facing a tough election in November, so the leadership surrender to the Democrats on immigration “is insanity,” she added.